Hyderabad, April 8: Amazon Seller Services Pvt Ltd (ASSPL) today announced fresh investments in the state of Telangana with the opening of a Fulfilment Centre (FC), spread over 280,000 square feet near Kottur, on the outskirts of Hyderabad. The FC will be operational from May 2015. This is the largest investment in infrastructure in any single state, to date, by Amazon in India. The FC will allow Amazon.in to offer its Fulfilment by Amazon (FBA) service to thousands of small and medium businesses in the state and empower them to gain access to and service customers across the country at significantly low operating costs. It will also enable faster and quicker delivery of products to amazon.in customers in the region. With the opening of the new FC in Telangana, Amazon will have 11 FC's operational across nine states in India covering a total of over one million square feet space with a storage capacity of over 2.5 million cubic feet. Welcoming the investments in the state, the Chief Minister, Sri. K. Chandrashekar Rao said, "We are very excited that Amazon has decided to invest their biggest Warehouse in Telangana. We have passed the TS iPass bill in our Assembly that ensures self certification and deemed approval of all clearances within 3 weeks of application for any Mega Project. For Amazon, we have given all clearances in 11 days, well within the guaranteed time. We are making all efforts to make Telangana an investor friendly state." ASSPL also signed a Memorandum of Understanding (MOU) with the Telangana State Government to train thousands of sellers across the state in ecommerce and take advantage of the digital economy. Under the MOU, Amazon India will offer trainings to SMEs through seminars, workshops, video aids and ready reckoners on how to list & manage inventory for an ecommerce business. 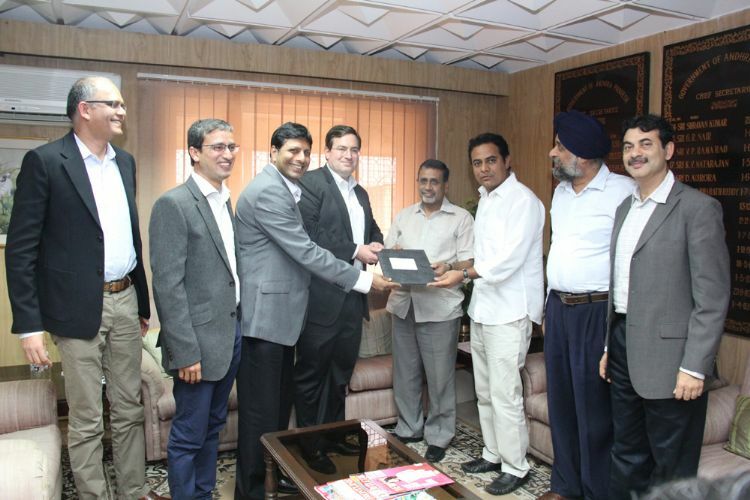 The MoU was signed in the presence of Telangana Chief Secretary Sri Rajiv Sharma and IT Minister Sri KT Rama Rao. Speaking on the occasion Mr. Dave Clark, Senior Vice President Worldwide Operations and Customer Service at Amazon said, 'Telangana has been home to our IT operations in India. It is the ease of doing business in the state, thanks to the progressive state government, that has encouraged us to make further significant investments in the state. The IT Minister, Sri. K. T. Rama Rao, commenting on the announcement said, 'Hyderabad, being centrally located has a geographical advantage, making it an ideal logistics hub. The fact that Amazon is setting up their largest warehouse here is a testimony to that. We believe that the Fulfilment by Amazon (FBA) service plays a very critical role in the growth of the SMEs in the state. It amplifies their reach at very low operating costs and gives them a level playing field with the big sellers. Amazon.in today offers the most comprehensive suite of services to sellers that meets their requirements at every stage of their business life cycle. It has already impacted the lives of over 100,000 sellers across the country by providing them services like Self Service Registration (SSR) that provides sellers an accelerated and friction-free path to Sell on Amazon and reach nationwide markets; Amazon Easy Ship, assisted shipping service wherein sellers can leverage on Amazon's investments in logistics to have their orders shipped straight from their own warehouses; Pay by Amazon wherein sellers can offer their customers a trusted and convenient payment option thereby increasing conversions; Fulfillment By Amazon (FBA) wherein sellers can store their products in Amazon's warehouse and the company packs and delivers the orders to customers plus provides customer service and manages returns. To facilitate seamless management for seller's on-the-go, Amazon recently introduced the Amazon Seller App that enables direct buyer-seller communication, order notification, order details, shipment confirmation and order fulfillment notifications through mobile devices. These services help sellers reduce their operational costs considerably as well as increase sales. As the profit margins increase, sellers pass on these benefits to consumers in the form of reduced prices.